We have made many sand drawings for lots of different people over the years. We love meeting and working with new people and setting new challenges for ourselves. 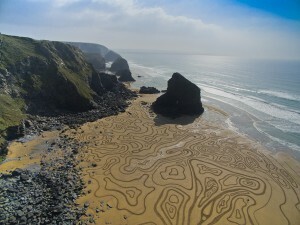 The Fallen 9000 and the 1km sand drawing we did with Land Rover were some of the most challenging to date. Sometimes it’s nice just to simply play in the sand and create things just for fun and experiment with new ideas and techniques, this is how we keep our sand drawings moving on and breaking boundaries with rake art. Now we were ready to go! The team would be the three of us, Jamie Wardley, Claire Jamieson and Tom Bolland. We would also be joined by Jamie’s mum, Pat and our baby girl, little Florence. 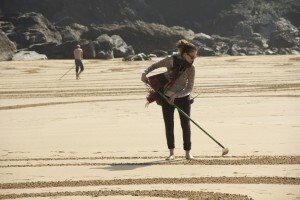 It would be Florence’s first visit to the beach and her first sand drawings. Her first of many to come, a little sand artist in the making! 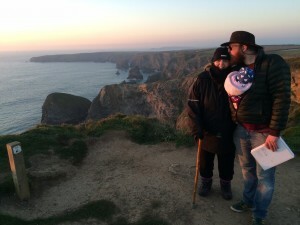 We packed up the van and the Mini and off we went. Booby’s Bay was our first stop. 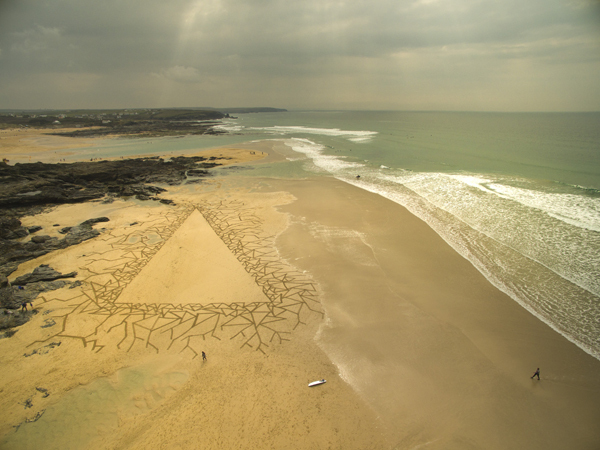 Here we wanted to see of we could create an anamorphic equilateral triangle sand drawing that could only be seen from the sky called ‘Balance’. . 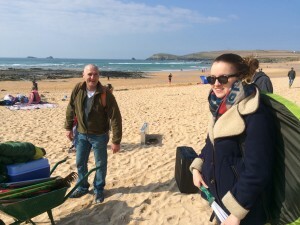 The sun was shining and as it was Easter Sunday, the Cornish beach was filled with locals and holidaymakers who were all very curious as to what we were creating. Even Jamie’s friend Sparrow popped by to see us and our sand art. 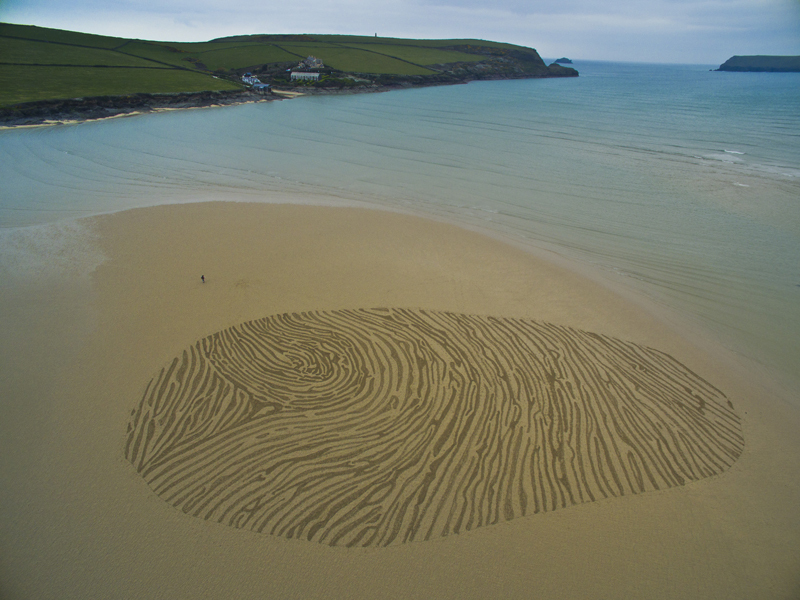 The results were fantastic and this beach art experiment was a success! 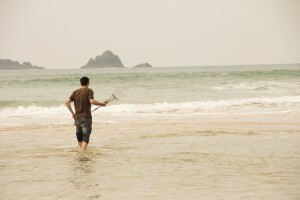 Tom did get wet running through the fast approaching tide in order to sort out a technical difficulty we were having! 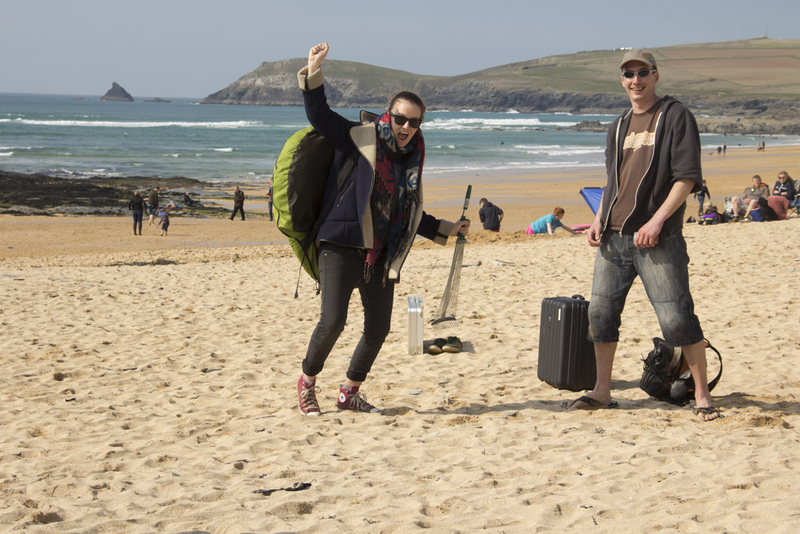 Our second day was to be Mawgan Porth. Jamie and I had been there the year before, running a sand drawing team building workshop with Nokia and Microsoft, so we knew the beach well. 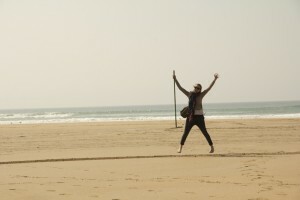 We wanted a beautiful beach that we could also take our daughter to, so she and grandma could join in the fun! Florence had actually been to the beach before, but then she was growing in my belly. This made it the perfect place to be Florence’s first beach experience. Our next piece was the ‘Goldilocks Zone’ which relates to the proximity of the earth from the sun making life on earth possible. 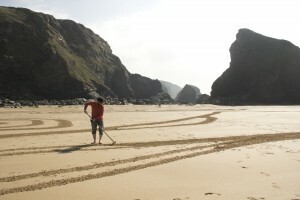 With the moon protecting us from asteroids and creating the tides which is so important in sand drawing. This again was an anamorphic design, just to make it more challenging for us! Even baby Florence got out her little rake and helped! The next drawing we did, we wanted somewhere a little isolated in a cove. 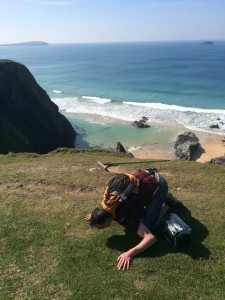 We went to Bedruthan Steps. 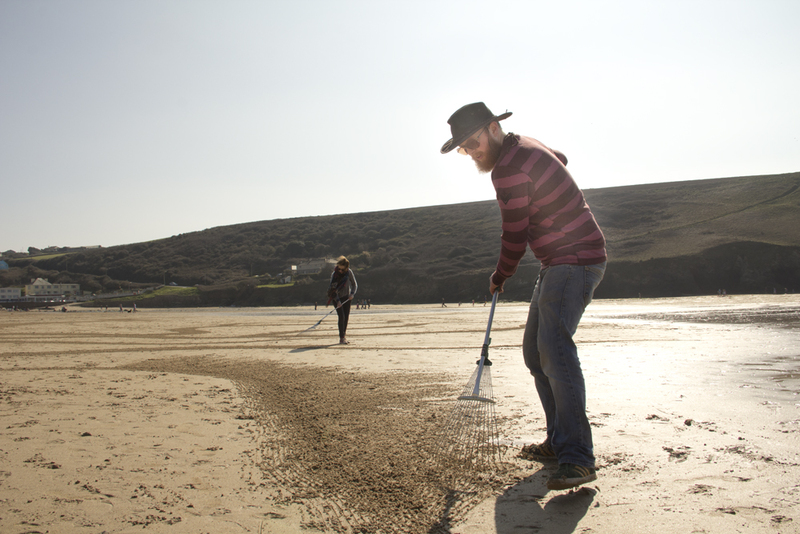 Once we had negotiated all those steps loaded with rakes, we found a spot a couple of coves on from the steps and began to rake! 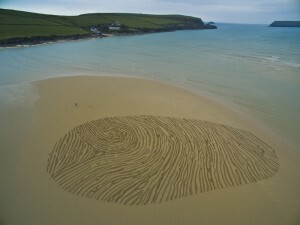 We wanted the design to be abstract free drawing Called and inspired by ‘Water Ripples’. 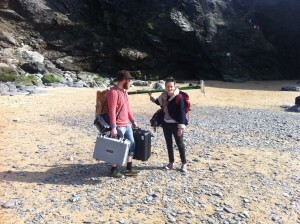 As the tide was fast approaching we took our images and headed off the beach. 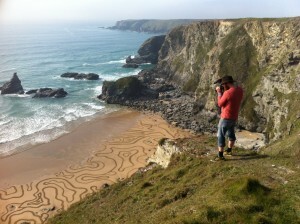 We watched from the top of the cliff as our sand drawing was taken by the tide. People always ask us if we are sad when all our hard work is gone almost as soon as we have made it. The truth is no. The sand art we create on beaches is ephemeral and that’s how we like it. 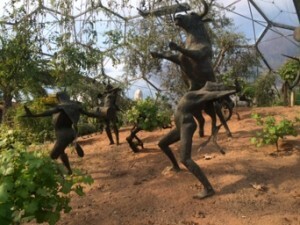 The locations we choose are so beautiful, we simply add to it at that moment. 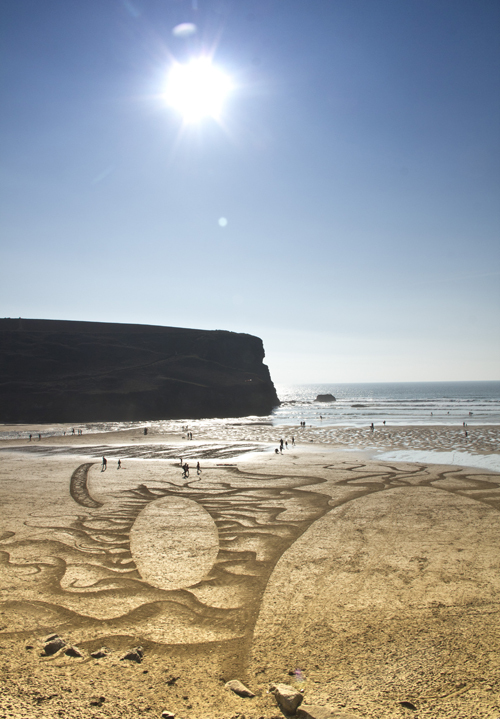 We wouldn’t want it to be permanent, we want the environment to be unharmed by our sand creations. The next day was Tom’s last day before he had to head off home. He had researched a cove and had fallen in love with it. 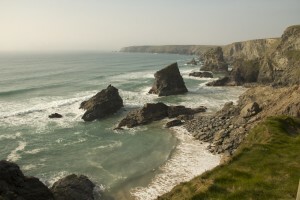 It was called Butterhole Cove, near Padstow. 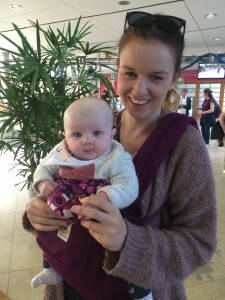 As we knew it had access issues, we dropped Florence and grandma off in the village and set off on our way. When we got there, Jamie and Tom began their descent down the cliff to the beach. 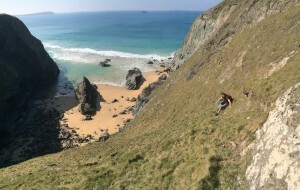 The descent was quite challenging and they both agreed that this beach wasn’t going to work and made their way back up. It will always be known as the one that got away! 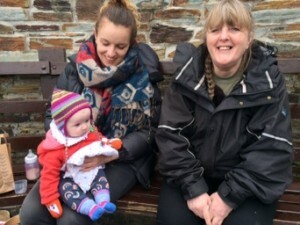 Once Tom had steadied himself on solid ground, we headed back to Padstow to catch up with Florence and grandma to have fish and chips by the water from Rick Stein’s takeaway. I’m a vegetarian, but the other’s assure me that the fish was great! We then said our goodbye to Tom, as he began his long drive back to Yorkshire. Tom back on solid ground! 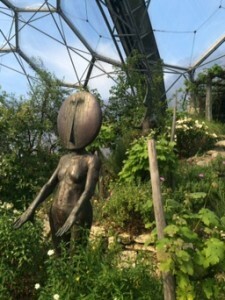 To have a rest from the sand drawing, as it is very physical, we went to visit the Eden Project to be inspired by this incredible place. A day well spent. 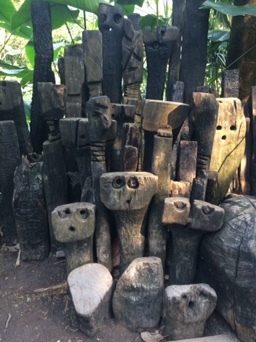 A mixture of ecological awareness and just spending time in nature inspired all sorts or ideas and possibilities. 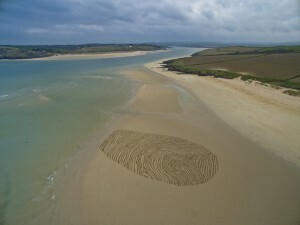 We then had our final sand drawing day. With just myself and Jamie, we kissed goodbye to Florence and Grandma and headed of to Hawkers Cove, rakes in hand. 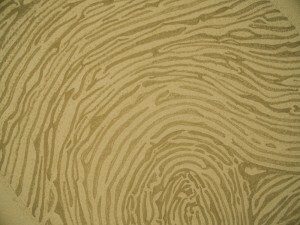 We had a design based on a thumb print. This again was inspired simply from life. 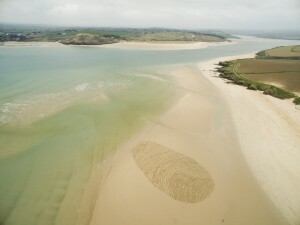 We used a mixture of set design and free drawing to create this final piece of land art. We raked hard all day to make such a big piece. Exhausted, we had finished and I personally thought the final image was such a great way to round off what had been an incredible trip to Cornwall.